Ready for your next business trip or holiday trip ? 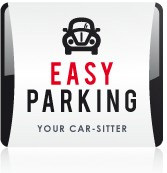 Let Easy Parking take care of your car, the only guarded car park combined with a valet-parking service on the Côte d’Azur. The valet-parking service, how does it work ? 1 - On your departure date, an Easy Parking driver waits for you at Nice airport or anywhere else of your choice (driver's direct phone number has been communicated to you when you booked). Once you sign the departure voucher, you may go. 2 - Our driver stores your car in the chosen car park (inside or outside). Secured and guarded, only authorized persons have access to it. Your car is insured by us while it's with us. 3 - On the day you return, you call our driver line and your car is returned to you where it was decided by you. In case of flight delay, no worry : our driver waits for you !